Cumberland County, southwestern Maine, U.S. 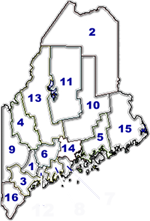 It largely consists of a coastal region, facing Casco Bay to the southeast, that includes many islands, although the terrain rises to the northwest. The centre of the county is dominated by Sebago Lake. The principal waterways are the Fore, Presumpscot, and Royal rivers. The Songo Lock, constructed in 1830 and rebuilt in 1911, connects Sebago Lake with Long Lake to the northwest. White and red pine are the dominant species of trees. Parklands include Sebago Lake, Bradbury Mountain, Crescent Beach, Wolf Neck Woods, Two Lights, and Scarborough Beach state parks. Cumberland county was created in 1760 and named for William Augustus, duke of Cumberland. The county seat is Portland, the largest city in the state and a former state capital (1820–32). Settled by the French and English, it became a major seaport by the mid-19th century, attracting immigrants from Scandinavia, Ireland, Italy, and Great Britain. It is also the seat of the University of Southern Maine (founded 1878). Portland and its surrounding cities (South Portland and Westbrook) and towns (Freeport, Scarborough, and Gorham) help make Cumberland the most populous county in the state. Pejepscot Indians were early inhabitants of Brunswick, where Bowdoin College (founded 1794) is located. Cape Elizabeth contains two historic lighthouses—Portland Head Light (erected 1791) and Two Lights (erected 1828; replaced 1874). From 1884 until his death in 1910, artist Winslow Homer perfected his sketches of the rugged coastal landscape in his studio in Prouts Neck. Local manufactures include pulp and paper products, electronic components, lumber and wood, footwear, and food products. Tourism and health care services also are important. Area 836 square miles (2,164 square km). Pop. (1990) 243,135; (1996 est.) 251,087.